New York State should slash the number of people who are held after arrest because they can't come up with cash bail. That is the message the Erie County Legislature sent to Albany Thursday. If you are arrested and can make bail, you walk out of the courtroom with the order to return for further legal action. If you can't make bail - even for a relatively low-level misdemeanor - you head to the Erie County Holding Center until the entire case is worked out. A lot of people can't make bail and wind up inside, potentially for a long time, even without being convicted. There is a large push for bail reform, especially for those misdemeanor cases. Legislature Majority Leader April Baskin spent months putting together a resolution acceptable to a majority asking Albany to end cash bail. "We've come to a place where this body agreed to be able to support an initiative that will first reduce the amount of food and clothing and medical care needed at our Holding Center and, secondly, just allow the taxpayers of Erie County to no longer be burdened housing low-level offenders that pose no risk to our community," Baskin said. For Legislator Barbara Miller-Williams, it is an issue of fairness, that disparate treatment of rich and poor. She knows the issues, as a retired Buffalo Police officer with years of experience taking people to Central Booking. "There are those who don't have the economic means to afford bail and unfortunately it is minorities, it is those that are underemployed or unemployed, and they find themselves at the Holding Center because they simply cannot afford it and that's not fair," said Miller-Williams. "That's an inequity that we definitely have to address. Where those who are economically able to do it. They can post bail and they're out." Miller-Williams said judges have to bear some responsibility because there are alternatives to incarceration and misdemeanor arrests don't lead to diversion often enough. Legislature Minority Leader Joseph Lorigo said he has escaped this issue in his private law practice. "I've been fortunate in my career that I haven't had to deal with situations like that," Lorigo said. "I know it happens. I know it's unfortunate. That's something that the state should look at in further detail." Gov. Andrew Cuomo has been saying since very early this year he wants to do something about cash bail and has moved it very high on his 2019 to-do list. California will become the first state in the nation to abolish bail for suspects awaiting trial under a sweeping reform bill signed by Gov. Jerry Brown on Tuesday. 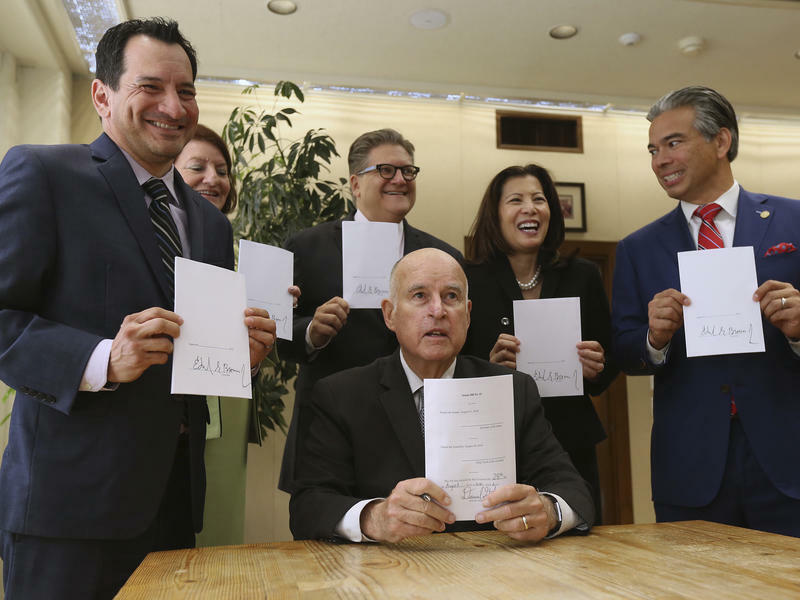 An overhaul of the state's bail system has been in the works for years, and became an inevitability earlier this year when a California appellate court declared the state's cash bail system unconstitutional. The new law goes into effect in October 2019. In an attempt to help low-income defendants who get stuck in jail before trial, New Jersey is eliminating cash bail this year for people accused of low-level crimes. The New York State Assembly has voted to eliminate the requirement for cash bail in most criminal cases. Pro football Hall of Famer and former Buffalo Bills star running back Thurman Thomas sat before an Erie County Legislature committee Thursday, expressing his support for cash bail reform in New York State.